This delegation—from left, Deacon Mel Tardy, Rev. Theodore Parker, Rev. Clarence Williams, Rev. 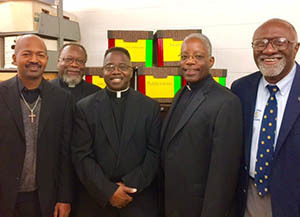 Kenneth Taylor, and Brother Roy Smith, C.S.C.—brought archival materials to the Hesburgh Library that will enrich the study of African American Catholic history. At the close of Black Catholic History Month, celebrated every November, Notre Dame is preparing major new resources for the ongoing study of religious experiences and social contexts highlighted during the month. The Cushwa Center for the Study of American Catholicism has announced that in late October, leaders from the National Black Catholic Clergy Caucus (NBCCC) presented a unique historical collection to the University Archives of the University of Notre Dame. Their decision to entrust a “treasure trove” of materials to Notre Dame evoked memories of Rev. Theodore Hesburgh, C.S.C., as a champion for civil rights, said Deacon Mel Tardy, a Double Domer who was part of the caucus delegation. It also offers the prospect of careful descriptions and selective digitization that will make the collection more accessible and better equipped for further growth. Tardy, who serves Notre Dame as a first-year academic advisor and St. Augustine Parish in South Bend as a permanent deacon, said archivists are sorting through the numerous boxes of correspondence, meeting agendas and minutes, photos, official statements, and other items relevant to African American Catholic history. He noted that Notre Dame senior archivist and curator of manuscripts William Kevin Cawley personally knew the NBCCC’s distinguished expert on African American Catholic history, Rev. Cyprian Davis, O.S.B., who built up the comprehensive collection before his death in 2015. Scholars and others interested in the historical context of African American Catholic life, especially since the NBCCC’s founding after the 1968 assassination of Rev. Martin Luther King, Jr., must await the indexing process before they can fully access the collection. It promises to significantly augment the documentary record not only for African American Catholic studies, but also for broader scholarship in U.S. religious history. The NBCCC established Black Catholic History Month in 1990. They chose November as the commemorative month because it contains the birthday of St. Augustine of Hippo and the feast day of St. Martin de Porres, said Tardy, who serves on the NBCCC board. St. Augustine and St. Martin—sources of special inspiration for black Catholics, along with Augustine’s mother, St. Monica—share African heritage.